I got this tree from the USDA at Chapman Field in Miami. My attraction to this tree was solely because it is an early flowering B type that I wanted to try as a pollinator for the early A type trees that I have. I'm not sure why it is in the USDA collection or what its attributes are. I grafted a few trees in late 2013 and some did set fruit on their first flowering. I'm not sure how good of a pollinator it will be, will know next season. Fruit wise it is also very early. Fruit starts turning dark in mid May but not sure as to its quality. 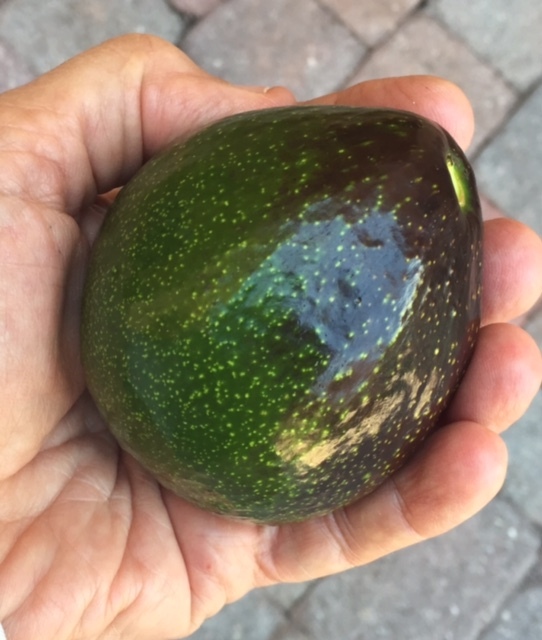 It is a very small 5-6 oz fruit think skin like a Mexicola with different shape. Will be able to report on flavor soon. I saw open flowers since late November and full bloom around December to January. Not sure it it is related to the cold spell we had in late February 2015 but I saw flowers on this tree in April seemed to me the tree had tree distinct flowerings during November to April. Very unusual. June 17, 2015: This is a very unusual tree, It has continue to flower sporadically since its maim bloom started in November. Now some of the trees seem to have a full bloom in the middle of summer. See today's picture.The fruit is small with big seed but eats decent.